This is one of those curries where if you throw it a hard stare, the lamb just kind of sighs and falls to pieces. There’s nothing tender about about the taste however, a meaty, earthy spicy hit that floods your mouth when you take a bite. It’s this melting but flavourful effect that makes lamb shoulder my favourite meat to slowly cook in a curry. The lacing of fat and connective tissues that run through the meat give it a glorious texture, and hold a decently strong flavour that stands up well to spicing. Warming aromatics and chilli heat go particularly well which is why there are lashings of ground coriander, garlic, ginger and a hot green chilli. They lift the lamb and the smooth earthy spinach and prevent it form becoming too cloyingly smooth. While the tumeric adds a certain earthy astringency. An almost undetectable foundation that’s essential to the curry taste. As I understand it, and I am more than happy to be corrected here, this is a typically North Indian dish, with the use of yoghurt, lamb and the spicing coming in with the Mughals from Central Asia. And it does have some similarities with what little Persian food I’ve eaten. Whatever its origins, this is one of the best ways to cook lamb. The main thing is to balance all the spices out with the aromatics and the lamb. You need enough to lift the flavour of the finished dish, particularly as the combination of spinach and lamb can be quite earthy, but not to overwhelm relegate the meat and vegetable to mere texture. If I were cooking it again I would add another green chilli and maybe some fresh coriander just to add a little freshness and zing to the finished dish. But that’s because it’s summery outside. If it were the depths of winter this would be perfect – soothing, warming and filling. The main thing here is not to stint on the cooking time. You must give the lamb time to relax and absorb the yogurt and spices. It’ll, as ever, be even better if you make it the day before and leave to soak everything up overnight before reheating the next day. I got this recipe by reading and combining elements of similar curries from Madhur Jaffrey’s Curry Bible and 50 Great Curries of India by Camellia Panjabi, and then adding the odd touch of my own. Both are excellent books and come highly recommended. 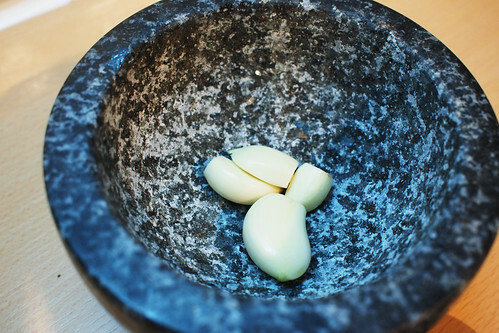 Mash the garlic, ginger, green chilli and ground coriander into a paste using a pestle and mortar and slather all over the lamb. Set aside for about 30 minutes to marinade. An hour would be better. Put 5 tablespoons or so of oil into a pan over a high heat. When it’s starting to shimmer add the onions and, stirring occaisionally, cook until they are golden and crispy. Don;t worry if some go a dark brown. Spoon out onto paper towels to drain, leaving behind as much oil as possible. Add the lamb to the oil, turn the heat down to medium and stir in the Cayenne, turmeric and salt. Cover and cook for 10 minutes, stirring once or twice. The lamb should shed some water. Plop in the yoghurt one tablespoon at a time, stirring each one in before you add the next. Add the spinach and stir until it wilts. Make sure everything is well combined, cover and turn the heat down as low as possible. Leave to cook for 50 minutes, stirring occaisionally. Make sure the lamb is super tender (I leave it to rest for another 15 minutes or so) and serve over rice. Sit back and enjoy. That looks insanely good. I think I need a curry night at home this weekend! You stared the lamb into submission? Blimey Aaron, remind me never to get into your bad books. Lovely looking curry………sir. @Su-Lin – thank you very much! Enjoy the curry. @Food Urchin – I am that kind of fearsome guy. You’d better watchout for my sideways glances. And, thank you Urchin. Grubworm with your tasty lamb curry you are spoiling us!! Good job, the lamb looks so tender and delicious!! You had me at “lamb”. Seriously one of the best meats especially in a curry. Wish I was there to try a bit. So lovely to catch up tonight! This looks proper good. 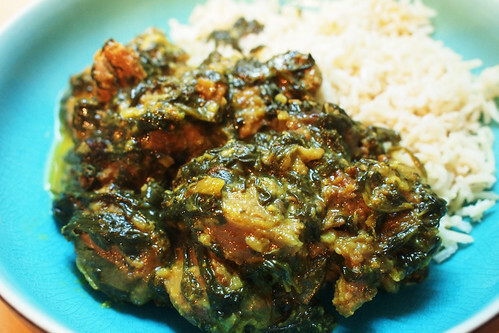 Lamb saag is one of my very favourite dishes. Looks really good. Lamb I reckon is the best meat to slow cook. I tried goat last week, and no matter how long I cooked it, it just stayed tough. Not sure if goat is supposed to be like that, or maybe just the batch I brought. Who knows. @Kavey – it was good wasn;t it? Interesting idea using methi leaves, i’ll have to give it a go. I have also used turnip greens and radish leaves before, both tasted great. @Mzungu – thanks! I agree about the lamb, so tasty. As for the goat, it might just have been the meat, i have had the same happen with venison and mutton before. Doesn’t matter how long you cook it, it stays as tough as leather. Weird. Worth trying a second time with another batch maybe? Yum, that sounds good. Any slow cooked lamb is delicious.. I just made a Cypriot dish the other night – also slow cooked lamb and it is just so ridiculously tender but meaty at the same time. Are you on curry roll? Last time I made a Saag I was shocked by how green it was, but it was fab Will try this one too. I made Rick Stein’s version of this and the amount of spicing he used was quite terrifying. 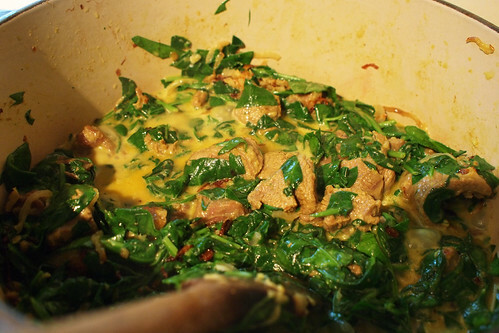 I am now craving lamb and spinach curry at 11pm, dammit. Great post! My mouth is watering! We are cooking our way through “50 Great Curries of India.” As of Feb. 2012 we have cooked 27 of the 50. Only a few of our finished dishes have looked like the beautiful photos in the book, but most have turned out delicious! Check out our tasting notes of each curry we have cooked so far on the “50 Curries Project” page of my blog: ‘Cycling Chef in the VeloKitchen.’ Look forward to your comments! @Cycling Chef – it’s a great book isn;t it? Sounds like you are doing better than me in working through it though! I hear you about the look of food, but that’s the case in almost every recipe book where the food is styled (and the photos optimised). @Karen – i hadn’t thought of that, will give it a go next time! Thanks. Grubworm, this recipe looks fantastic and I am testing it right now. But I have a question: what do we do with the onions after they have been fried and drained? Should I add them back at the end? @george and @roberto – thanks guys! @Sandrine – thanks . You add the onion back at the end as a sort of garnish. But you could also leave it in the curry and cook until soft (instead of crispy) and it would add some more sweetness to the whole thing. Hi Yvonne – I don’t see why not, if you do that I would be really interested in hearing how it went.